With immunotherapy bringing massive treatment breakthroughs across a range of cancer types, novel preclinical immuno-oncology models are needed to tackle further development challenges and drive forward anticancer immunotherapy research. This includes models with functional immunity, to improve on research using immunodeficient mice. 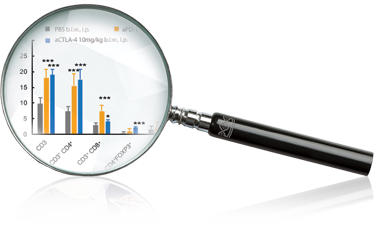 CrownBio provides an extensive In Vivo Immunotherapy Translational Technology Platform, which includes a range of murine immunity efficacy and PD models. 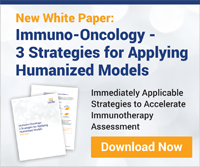 These are excellent tools to assess how cancer therapies perform within a fully functional immune system, for initial efficacy testing and to advance compounds through preclinical study. 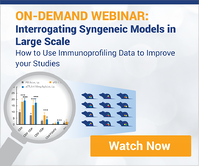 Our suite of syngeneic tumor models provide a valuable system for assessing new single agent and combination immunotherapies within mice with fully competent immunity. We provide nearly 20 cancer types, with over 30 syngeneic tumor models available or in development. CrownBio also provides MuScreen™ the first large-scale, syngeneic in vivo screening platform for cancer immunotherapeutics. 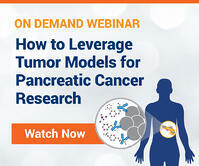 Using fixed sets of syngeneic tumor models clients can rapidly focus immuno-oncology research efforts such as screening for efficacy, evaluating combination therapies, and qualifying drug resistance in a cost-effective manner. Our syngeneic models are complemented by our murine homograft models, MuPrime™. Comprised of homografts of spontaneous murine tumors derived from GEMM/carcinogen-induced primary mouse tumor models, MuPrime combines the improved predictive power of their parental models with an operational simplicity, consistency, and robust growth for pharmacology research, incuding efficacy and PD assessment. The MuPrime collection covers a wide diversity of cancer types, and enables preclinical research into, and discovery of, specific pathways and predictive biomarkers for targeted immunotherapy agents. Our murine efficacy and PD models are fully validated with treatment data including checkpoint inhibitors, immunoprofiling, and RNAseq data available providing confidence throughout our full In Vivo Immunotherapy Translational Technology Platform. Contact us today for further information and for expert assistance in selecting the right murine efficacy immuno-oncology models for your preclinical research needs.